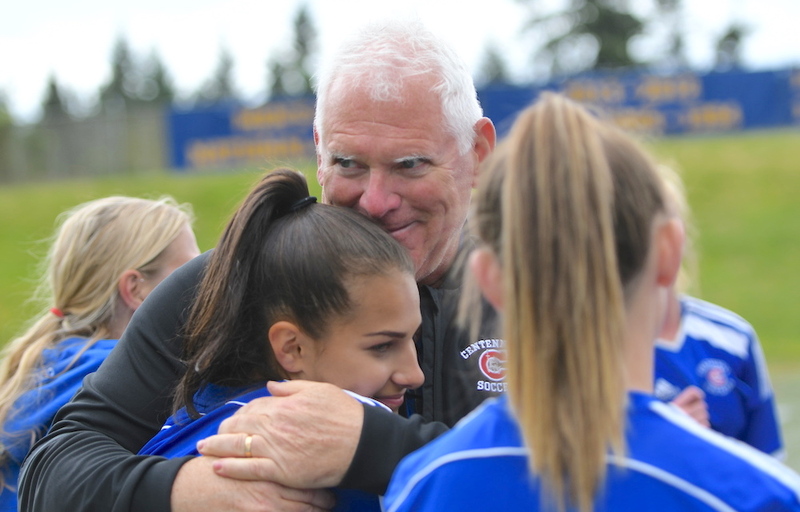 “My wife (Darcel) told me to retire because it doesn’t get any better than this,” the Yoda-like Moro joked in the moments before the Centaurs took to the field at UBC’s Thunderbird Stadium on Friday afternoon in their first B.C. finals championship game appearance since that day back in May of 2000. Finally, after all these years of trying, the Centaurs gave Moro that feeling all over again, striking for a stirring goal with about two minutes remaining in overtime to beat Surrey’s Fleetwood Park Dragons 1-0. “We wanted this, this is why we play and I am so proud of my program, that we have gone to provincials in 16 of my 19 years here and never finished outside of the top 10,” Moro said, fighting back tears after his Centaurs were finally able to overcome the pluck and fearlessness shown by the Dragons, who despite being outplayed on the day, remained a most dangerous foe. The Centaurs threw everything, including the proverbial kitchen sink at the Dragons who turned back a pair of dangerous headers from close quarters, cleared one ball off the goal line in the first half, and just generally maintained their composure in the face of extended Centennial pressure. It wasn’t until just over two minutes remained in the 15-minute overtime session that the Centaurs were able to strike. 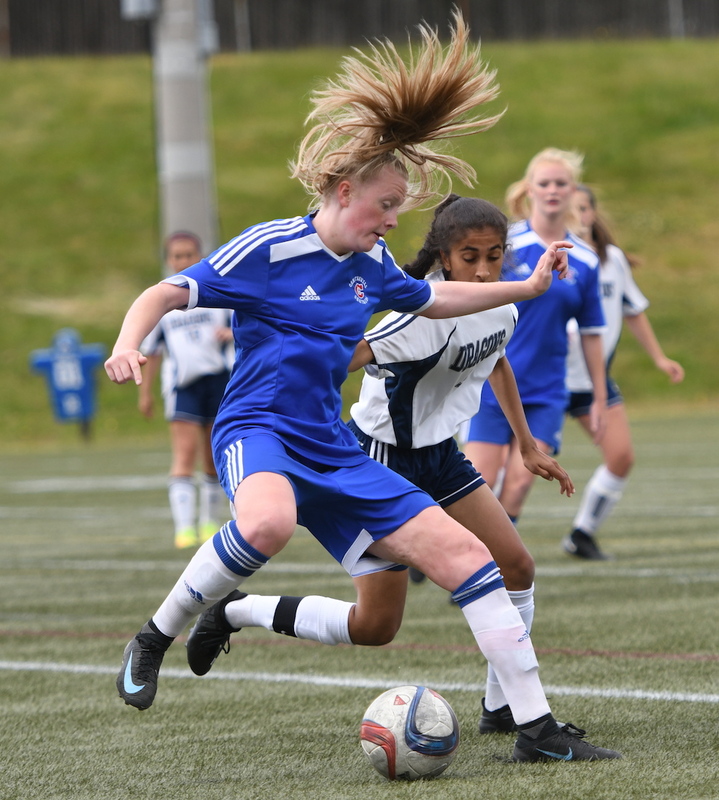 Grade 10 attacking midfielder Raegan Mackenzie, from close quarters, seemed for just a second to slow the game’s frenetic pace. It was a pause that created time and space. And when she followed her vision, the result was a deft ball placed right in the wheelhouse of Grade 9 striker Sophia Ferreira who potted the winning goal. As Moro stressed afterwards, it was a big moment for a Grade 9 player, and the diminutive Ferreira, who sobbed such tears of joys she could barely speak, later recovered enough to offer her thoughts. Listening to a ninth grader who was set up for the winner by a 10th grader is reason for joy if you’re a Centennial fan because it looks like the program has entered an extended period of title contention. Moro in fact, started eight players in the ninth or 10th grades on Friday. And remember, Fleetwood Park does not have a single senior on its entire roster. If you’re taking odds on who might meet in the 2019 final, you could do a lot worse than the Centaurs and Dragon, the latter which will be led the likes of returning stalwarts like Simran Billen, Karmin Dhindsa, Nikki Virk, Jenieva Musico and so many others. And despite the fact that a more experienced Centennial team carried the play for large stretches, those following the tournament knew how dangerous Fleetwood Park was. The Dragons, in fact, may have been outplayed in their Thursday semifinal by South Delta, but on Friday it was the Sun Devils who were on the outside looking in. Moro was a little slow running onto the field to join his players in celebration, but when he got there, he announced that he was ready to do some hugging. Two decades after winning it all in his first season at the helm of the Centennial soccer, he had brought his team back to the top of the mountain. Sure, he was happy he didn’t retire after that first title back in 2000. But on Friday, what really gave him joy was to be able to share that old, familiar feeling with his players. Almost 20 years later, you could see it as plain as the tears on his face. It’s something worth waiting for.